Red deer (Cervus elaphus L.) is the largest wild animal species in the Federal Republic of Germany, with the exception of the occasional migratory moose. Red deer are socially living ruminants, originally inhabiting open forests while changing habitats according to the season. Today they are distributed spotwise across the country, whereby many large regions are purposely kept free of red deer. The remaining habitat is greatly changed and restricted by human influence (traffic, tourists, etc.). In order to evaluate the demands of red deer on their habitat the knowledge of their spatial and temporal behaviour is necessary. In Germany there are at present few reports on this topic. The spatial organization of this animal species has been studied using conventional telemetry among other researchers by GEORGII (1998) and STROKA (1987) who investigated this in the alpine regions. The goal of the presented investigation was to determine for the first time the size of the ranges and the seasonal migrations of red deer in central and northern Germany. For this purpose the localization of red deer using GPS collars was to be determined and the data subsequently in part transmitted by satellite TUBSAT -A to the ground station in Berlin (Fig.1). The GPS instruments were programmed in such a way that they could determine the locality of the red deer 3 times per day over a period of 12 months. The average error (+ s) of the position determination was 80 (+ 69) m, the median of the measured values wa 60 m.
The study was conducted in two research areas in the Harz. The altitude varied in the western investigation areas (Reifensbeek and St. Andreasberg) from 500 to 1000 m above sea level. The eastern parts of the research areas varied in altitude between 400 and 600 m. In both investigation areas the forest is comprised of dense spruce stands, interspersed only occasionally by wet meadows. The animals were immobilized at selected feeding areas during the evening hours, using a tranquilizing gun or blow pipe with injection projectiles of the system TELEINJECT. Depending on the estimated weight of the animal, 2.0 - 4.0 ml of “Hellabronner Mixture” in 10% solution was injected (WIESNER, 1998). During the winters of 1996 to 1998 attempts were made to immobilize and collar red deer at 13 feeding stations. Finally, at 9 of these feeding areas 9 female and 7 male animals could be outfitted with GPS collars. 3 of these for the second time. In total the GPS collars determined 15,046 positions of the animals. In respect to the spatial-temporal behaviour of the telemetrized red deer, the animals could be divided into 3 groups: Animals that roam throughout only one area for the whole year, animals with separate summer and winter ranges, and juvenile red deer that are looking for a new area. Single ranges were mainly observed when winter feeding stations were included in the summer range,especially true for the eastern Harz. The female red deer Nrs. 4, 5, 6, and 7 moved around in direct proximity to each other, their ranges are depicted in Fig. 2. It was noticeable that these animals preferred contiguous ranges which only overlapped at the outer boundaries. Typical for these animals is the intensive utilization of a central area from which point the periphery of the range is often visited, but only for a short time whereafter they return directly to their “home base”. They did not undertake extensive wanderings or excursions into other areas (Fig. 3). The female red deer telemetrilzed in the western Harz (Reifensbeek and St. Andreasberg) used spatially separated winter and summer ranges (Fig. 4). During the summer and fall they occupeid the higher altitudes where there usually are no winter feeding stations. In November/December they wandered back down 2-6 km to lower lying regions in order to spend the winter in the vicinity of feeding stations. The travel between summer and winter areas took only a few days. The particular significance of the winter feeding of red deer is also demonstrated by the fact that with the exception of two one and one half year old animals, all the others during the entire investigation period returned to their habitual feeding stations. This fact provides the possibility to influence the behaviour of the animals through selected placement or re-placement of winter feeding stations. Among the animals showing only one range throughout the year, the winter area was always enclosed in the summer range. The size of the summer territory thus corresponded to the size of the territory used throughout the whole year. The locality of the winter territory among the animals with separate summer and winter ranges as well as those with only one range is clearly determined by the location of the winter feeding stations. In Fig. 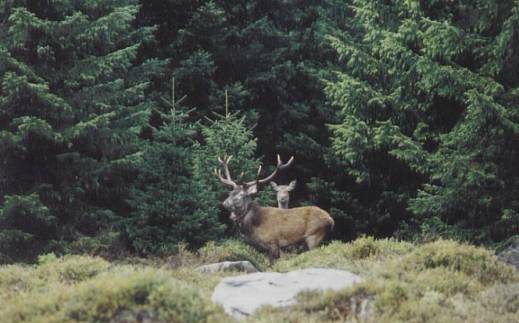 5 the size and location of the ranges of the red deer investigated in the eastern Harz in 1996 are exemplary. In the eastern part of the investigation area in the Harz the female red deer used their range uniformly intensively, which resulted in a relatively homogenous distribution. In contrast the movement of the red deer in the western part of the Harz causes a seasonally uneven distribution of the animals within the ecosystem: Feeding station are mainly found in the valleys or on the lower slopes where the red deer then concentrate within an area of a few hundred hectares. Under normal snow conditions the higher altitudes are then free of red deer. During the vegetation period these circumstances are reversed, only few animals occur in the valleys - most of them occupy the higher regions. Among the 5 young red deer that were telemetrized in the eastern Harz the pattern of spatial use was much more diverse than among the older animals and adult red deer. As an example of this type of spatial use the position points of red deer Nrs. 12 and 16 from the year 1998 are depicted in Fig. 7. The young red deer spent the winter in a relatively small area around the feeding station, but during the summer they moved to an area several km distant. The change between the winter and summer ranges never occurred suddenly. In spring the animals extended their winter ranges slowly west or north of the feeding station. The summer ranges were located on average 5 km from the centers of the winter ranges. In the fall the animals gradually returned to their winter areas. The size of the annual ranges determined by the convex polygon method is significantly different for female and male red deer (P<0.01) Among female red deer (n=9) the size of the range averaged 679+ 157 ha., among male red deer (n=7) 1962+244 ha. The area sizes of the winter territories were significantly smaller for both female (157+63 ha) and male animals (244+59 ha) than the respective summer ranges. Georgii B.; 1980: Untersuchungen zum Raum-Zeitsystem weiblicher Rothirsche (Cervus elaphus L.) im Hochgebirge. Dissertation, Univ. Muenchen. Stroka I.; 1987: Untersuchungen zur Raum/Zeitnutzung an Rothirschen (Cervus elaphus L. 1758) im Nationalpark Berchtesgarden. Nationalparkverwaltung Berchtesgarden, 94 S.
Wiesner H.; 1988: AnÃ¤sthesie von Zoo- und Wildtieren. Tieraerztl. Umschau. 43 (Nr. 1): 36-42. The investigations were supported with funds from the German Agency for Space Flight (DARA) and by hunting research funds from the Ministeries of Nutrition, Agriculture,and Forestry of the states of Lower Saxony, Saxony Anhalt, and Thueringen. To Dr H. Woelfel from the Institute for Wildlife Biology and Hunting Science of the University of Goettingen we extend our greatest thanks for his assistance in tranquilizing the red deer and outfitting them with GPS collars.